More than a decade ago, The Eternity Portfolio presented a groundbreaking framework for managing your money intentionally to invest in God’s kingdom. Grounded in the historical Christian belief that to the extent we have food, clothing, and shelter, we must decide what to do with the “excess,” financial advisor Alan Gotthardt cast a vision for God’s kingdom as the ultimate investment opportunity for that excess, whether $100 or $1 million. Gotthardt’s flexible, practical strategy will equip anyone with the tools to make an Eternity Portfolio an integral part of a solid financial plan. Times change and methods change, yet biblical principles endure. Building on the framework of the first edition, the author has expanded and illuminated the content based on more than a decade of observations, questions, and experience engaging audiences and advising families. This new edition also features seven other world-class, kingdom investors who add their perspective with annotations throughout. Never before in history have so many Christians―rich and poor―been focused on stewarding their material possessions in light of Christ’s kingdom. 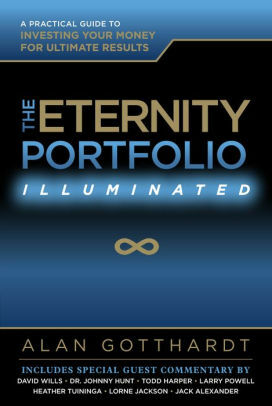 Now The Eternity Portfolio, Illuminated brings expanded insight to empower those already on the journey of generosity, as well as wisdom for the coming generations who desire to be intentional about their finances in light of eternity. Quote: David Wills, “To lay up treasure in heaven, we must invest in what will be there-God and people” (35) Focus on people from down here, because they will be up there as well. Note: Time on earth is short, invest in kingdom things like people and God’s economy. If you focus on the wrong things God may judge and it can mess up not only your earthly life or eternal life. Note: It’s okay to be wealthy in money, but know where your heart lies. If you are fulfilled with the spirit, then money wont effect your actions or happiness. Quote: Dr. Johnny Hunt, “I wish to add joy to the obligation and opportunity of giving. I have come to realize that one of the great joys of life is giving to others” (43) He realizes giving is more important than receiving. Quote: Todd Harper, “ Far from being an obligation, giving is a ‘disciplined passion.’ A generous giver told me once that when he gets a windfall bonus or profit,’ We don’t go shopping at the mall, we go shopping in the world.” (43) You must be disciplined to develop a passion. Note: There are three types of rewards in the Kingdom of Heaven: crowns, authority, and treasures. Note: It’s okay to seek eternal rewards. You’re only hear for a short period of time. It’s important to prioritize how you will seek these rewards. This requires a vision. Quote: David Willis, “The process of planning creates clarity, and clarity results in purpose. Purpose reduces fear and brings more clarity.”(64) Fear can be indirectly taken away by planning. Quote: Larry Powell, “Have the freedom to say no: ‘What you’re doing is a wonderful thing you are doing for Gods kingdom, but it’s not what he’s put on my heart.”(64) Someone’s service may not be yours. Somebody being a doctor might be fulfilling God’s nice, but it my not be what God is calling someone else to do. Note: When a person plans, that type of discipline turns into excitement, which turns to happy giving. Note: Don’t give for man to see, God doesn’t approve of that kind of giving. Man needs to give only so that it is necessary for his heart to be filled with the holy spirit and for God to see. Quote: Todd Harper, “It’s quite a challenge to sit from time to time and ponder this question: ‘How much would I have to have to give what I sense God wants me to give?” The amount can be difficult to think of when you could give a lot, but don’t know when or if it’s enough. Quote: Jack Alexander “Am I more in love with the kingdom of God than the Kingdom of this world?” When sin is built within us, it’s easy to love the kingdom of the world by getting distracted. Of how much someone can love the world is dependent on how much time he spends on God. Note: Prayer can help when a family or individual is spending outside of their means. Note: Exponential Generosity requires being systematic, proportionate with managing house and work finances, and making sure needs are met for giving to others. When generously giving in an exponential way, set aside an account that remains untouched. Note: Throughout this chapter, Alan Gotthardt emphasis the importance of the financial finish lines, then describing what the ‘finish line’ is. Furthermore, he talks about how much is enough as we are all different, and that having enough not always means stop working. Gotthardt concludes with what we should expect who we cross the ‘finish line’, which he describes as not the end of life but instead the end of the need to invest in a Family Portfolio. Note: It is very obvious from the quotes above that this chapter speak of helping those who are in need. This chapter fits in well with what we have been learning/taught throughout the semester, it better to give than receive. Alan also writes that the church should be the leader in this giving process. Besides sharing with others, Gotthardt write with some advice where we should invest and the types of investments we should make. Note: Gotthardt speaks about accountability and how it would benefit all parties. Furthermore, he discusses on what to look for in a good investment. As the quote above says, we should not have pride be the driver as we invest, but instead invest in better reason. Quote: “You might think that only way to leave a legacy is by virtue of a massive financial fortune accumulated over a lifetime. Although we will discuss opportunities to use wealth in this way, the highest return potential actually has little to do with the dollar you leave. Training others to be faithful managers offers a greater reward because in some way you will share in the rewards of their efforts. Note: Giving it the next generation. As. I have shown in one of the quotes above, it money that really matter in this concept. Money comes and goes. However, it’s the training. Teaching the concepts, tools and techniques to the next generation will not bring in money, but more ideas too for the next generation after.